Position the décor as high up as possible. 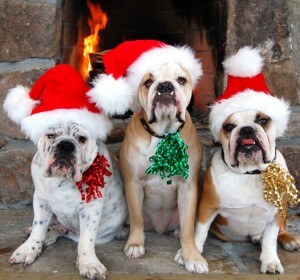 Try to get the Christmas décor as high up as you can so that your pets will not be able to reach it. Ensure that wires and lighting fixtures also hang overhead so that there are no accidental electrocutions or fires that ensue. Make use of topical animal deterrents. It is probably inevitable that some Christmas ornaments will be within reach or accessible to your pet. In this case, what you can do to keep your pets at bay is to pick up topical animal deterrents and spray them heavily on objects or places that you do not want your pet to get close to. Substitute battery-powered candles for real ones. These are definitely more hazard-free in the event that a candle gets knocked over by a furry friend. Keep your tree secure. The Christmas tree is debatably the most accident prone ornament in the home. In order to keep your pets from knocking it over, keep it secure by attaching it to a wall or to the ceiling. Be sure that your pets aren’t able to access the stand of the tree as well as the sap of a live tree is toxic to puppies and kittens. Keep candy canes, popcorn garland, and other human treats out of reach. Plenty of human food can be harmful to animals and all the sweets that are staples during the Christmas season should be kept away from them to avoid poisoning or tummy trouble. Keep them high up on a table. If possible, you may want to keep your pets in an enclosure or crate during the festivities.